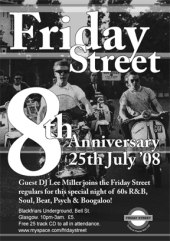 If you can’t make it to the Glasgow mod weekender, or simply want to get more of the same mod action, then take note: Friday Street celebrate its 8th anniversary this July. On Friday July 25th expect the usual first-class mix of R&B, soul, boogaloo, and beat from the regulars, plus guest DJ Lee Miller. And taking home the musical memories is made easier, as everyone who attends will receive at 25-track CD absolutely free. For more on Friday Street go to the Myspace page here.